Many movie novelizations are surprisingly different than the actual movies. The original Star Wars had a book version that was weirdly different and came out months earlier. So it’s probably not surprising that The Force Awakens’ own novel is contains some surprising moments that aren’t in the film. Suffice to say, there will be major spoilers throughout this post for The Force Awakens. Not seen the movie yet? You’re going to want to get out of here pretty sharpish! Alan Dean Foster—who wrote the very first Star Wars novelization (although he was credited as George Lucas in its first edition)—returned to write the Force Awakens novel. This book is already available as an e-book, with no physical release until January, for fear of spoilers. 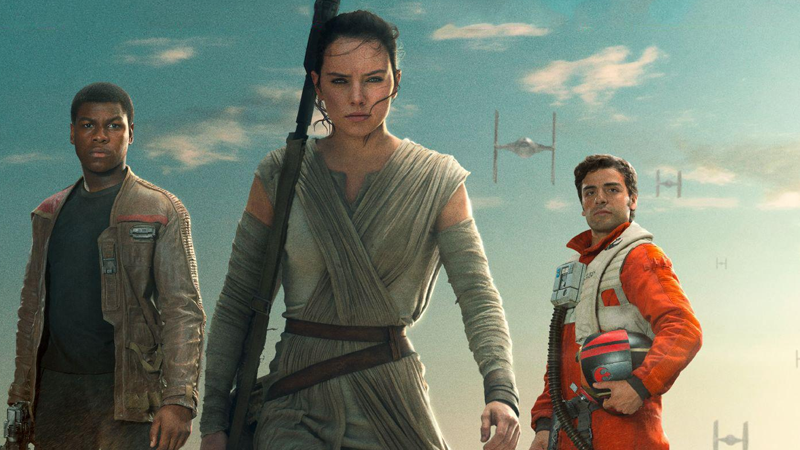 We devoured the Force Awakens novel over the weekend, and noticed there were some pretty surprising differences. Here’s some of the biggest changes between the book (which was presumably written from a near-final draft of the script, as is the case with many movie novelizations) and the final movie. Supreme Leader Snoke is a whacking great mystery throughout The Force Awakens. Who is he? Where did he come from? Is he a Sith? Is he really that big, or is he holocommunicating with some major compensation issues? It is far more than that. It is where you are from. What you are made of. The Dark Side—and the Light. The finest sculptor cannot fashion a masterpiece from poor materials. He must have something pure, something strong, something unbreakable, with which to work. Snoke then recalls to Kylo that he saw the Empire “rise, and then fall”, and even that he knew that Darth Vader was Luke’s father (which is probably something Luke didn’t go touting publicly after Endor). This is something that he may have learned while seducing Ben to the dark side, admittedly, but in the book it’s implied that it was something he already knew at the time, anyway. The book really emphasizes that Snoke was a major presence throughout the events of the previous films, though, more than the film did—and that he has a vested interest in the Skywalker family lineage. After Finn and Poe liberate themselves from the Finalizer and crash land on Jakku, Poe essentially vanishes from the film until close to its climax—and there’s a reason for that, as he was originally meant to die early on, presumably in this crash. The movie gives Poe a wishy-washy brief explanation for his survival (he ejected, and then went on his merry way) but doesn’t actually go into how Poe got off Jakku. This was one of our biggest questions, and at some point, it looks like the movie was going to answer it. In the novel, Poe doesn’t eject, but wakes up in the crashed TIE, and groggily wanders off pretty much just as Finn is running to it—he doesn’t hear his shouts because he’s concussed. Poe eventually meets up with a scavenger wandering the Jakku deserts, strikes up a connection with him the way he did with Finn, and then protects the scavenger from an attack by thugs with some slick speeder piloting. The scavenger takes Poe to an outpost where he can contact the Resistance for backup. Remember how Han threatens C-3PO in A New Hope by saying that Wookiees have a habit of yanking people’s arms off when they lose at a game? Well, The Force Awakens nearly showed us that threat in action. Bloody hell. Understandably, you can see why that was cut from the film. But that moment would’ve been another link between The Force Awakens and A New Hope. Okay, so Star Wars plays very loosely with the “science” part of its “science-fantasy” genre—parsecs, anyone?—but even by the franchises’ most egregious standards, the way Starkiller Base works in the film is quite frankly ridiculous. It’s still ridiculous in the book, but it makes way more sense. Instead of slurping on stars like they’re hot, plasma-laden smoothies, Starkiller Base is powered by dark matter, which seems like a much more sustainable source of energy. In the film, when the base’s weapon fires, it shoots a single beam of energy across hundreds of thousands of miles... that then somehow inexplicably splits into 5 separate, pre-targeted beams to blow up the Republic Capital world Hosnian Prime, its four moons, and the New Republic’s fleet. In the book however, it plays out far differently. Starkiller Base doesn’t shoot a gigantic beam, but a ball of energy that is shot through sub-hyperspace, making it disappear just outside of the base, and then reappear just outside of its intended target. The ball of energy supercharges the target planet’s core, making it go supernova and burn up any nearby planets in the ensuing explosion. It’s still very silly Star Wars science, but way better than what we got. In the destruction of the Hosnian system, Leia loses someone close to her. Her Resistance-Senate envoy, Korr Sella (who was going to be played by Maisie Richardson-Sellers), is on Hosnian Prime on Leia’s behalf when Starkiller Base destroys it. I would have a terrible ‘accident,’ or become the victim of some ‘deranged’ radical. Or I would eat something that didn’t agree with me. Or encounter someone who didn’t agree with me. Hey, Senators, show some respect to the lady who helped make your Senate in the first place! Wait, too late, you’re all dead now anyway. Kylo Ren—a.k.a. fallen Jedi Ben Solo—and his emotinal trauma are some of the most intriguing parts of The Force Awakens. He’s really the first villain in the Star Wars movies that we’ve met, who is consumed by turmoil and his own nebulous rage. In the book, that rage is considerably less nebulous: Ben despised his father, finding the smuggler he really was could never match up to the expectations he had from Han’s legendary role in the Rebellion, a disappointment Snoke capitalized on. In the movie’s most poignant moment, Ben draws his father (who, in the book, is revealed never to have seen his son as an adult until Ben takes his mask off in front of him) close with a touching declaration of his personal conflict, only to reveal he was drawing Han in to stab him through the heart with his lightsaber. In the film, it’s very clear that Ben is doing this to set himself firmly on the path to the Dark side, not on a redemptive arc towards the light—and even JJ Abrams has since said that it was meant to show there is no longer good in him. It’s an interesting distinction that leaves interpretations of the movie scene up for debate. I’ll just come out and say it: The book confirms that Han and Leia got married after the events of Return of the Jedi. Sorry Rob, your unhappy ending just got a little unhappier. I was hoping that I was wrong, that it wasn’t true. I hoped I could sway him, turn him away from the dark side, without having to involve you. I was afraid that your reactions would only drive him farther to the dark side. I thought I could shield him from Snoke’s influence and you from what was happening. Her keeping the secret was part of why Han left her following Ben’s ascension to the Knights of Ren and the massacre of the new Jedi Order—because as in the movie, Han believed that it was his fault Ben turned. Who started chopping onions in here? Although they were plastered all over the toys and merchandise for the film, the First Order’s snowtroopers barely appeared—some were at the First Order rally, and that’s it. But now we know why they and their speeders ended up being such a big part of the toy push: a whole action sequence from the climax was cut from the final movie. In the novel, when Rey and Finn make their way to the oscillator to plant their last set of bombs, they do so by hijacking a First Order snowspeeder—which leads to a big chase as Snowtroopers took pursuit of the heroes. Some of this may have come down to the fact that in earlier drafts, Poe was meant to die earlier on in the film, but one of The Force Awakens’ most oblique homages to A New Hope almost didn’t happen. In the book, the Resistance’s X-Wing squadrons simply bomb the oscillator with everything they have after Han’s ground team blow it wide open—no trench, no fancy flying, just a simple run. Completely different to Poe’s crowning moment as he goes solo and flies into the oscillator, torpedoing it from the inside. Although JJ Abrams has already clarified how R2-D2 managed to miraculously restart himself after his self-induced droid coma in the movie, the book actually offers an alternate, simple reason. According to Abrams, it’s the mention of the Imperial Archive that kickstarts R2’s awakening, a process that takes place over a good chunk of the film—but in the book, the astromech simply hears the mention of the Imperial records as where the files stored on BB-8 are from, and wakes up almost instantaneously, sensing the presence of the remaining part of the map nearby within BB-8. The final moments of The Force Awakens are silent—Rey, having found Luke Skywalker, holds out his old lightsaber to the venerable Jedi Master, silently imploring him to recognize the weapon. Remembering, Rey reached into her pack and removed his Lightsaber. Taking several steps forwad, she held it out to him. An offer. A plea. The galaxy’s only hope. It’s probably for the best she didn’t quote his own sister at him. I’m not sure Luke would’ve appreciated it.